With the stress test spectacle behind us, the US banking industry is preparing to report second quarter earnings and, most important, begin a big return of capital to shareholders – a bounty that will, in fact, exceed earnings. Q1 ’18 saw pretax earnings for all US banks hit a record $71 billion, a remarkable achievement that may or may not be repeated soon. Yet so overcapitalized (and under levered) are US banks that they can maintain excessive loan loss reserves and still be paying out net capital to equity investors. You don’t need a stress test to understand that the regulatory pendulum has swung too far when it comes to bank regulation in the US. Both bank lending and deposit growth are falling as the Federal Open Market Committee tightens credit. Duh. We should recall that the first stress test, which was the rare brainchild of Treasury Secretary Tim Geithner, was about restoring confidence, not measuring capital. But ever diligent, the model builders at the Fed have turned a deft psychological move into a ridiculous academic exercise and full-tilt media circus with no real analytical value for banks or the public. If the inputs are not standardized so as to make the output comparable, then what is the point of conducting this public exercise? What we do know is that the US banking industry is under rising stress – due entirely to the FOMC. In a conversation with Lee Adler in The Institutional Risk Analyst, he described how even the passive runoff of Fed reserves is tightening credit dramatically, a secular and mechanistic phenomenon that could boost the rate of change in bank interest expense from the 60% YOY currently to triple digits by next year. Got that? Suffice to say that each bond redemption as part of quantitative tightening or “QT” is withdrawing an equal amount of reserves from the system. The fact of quantitative tightening, however, is not helping banks maintain net interest margins. First, the outstanding, passive stock of $10 trillion or so in securities held by the Fed and other central banks effectively caps asset returns. But more important, we are in a long-term trough in terms of both interest rates and, necessarily, asset returns. And the Fed’s obsession with keeping rates above zero, yes that’s right, has created a classic liquidity trap for Wall Street. Star Wars fans will recall the scene in the first film when Luke Skywalker and his companions are stuck in a giant trash compactor. This is a beautiful metaphor for the current situation facing the credit markets. Question is, has anybody on the FOMC seen the movie? 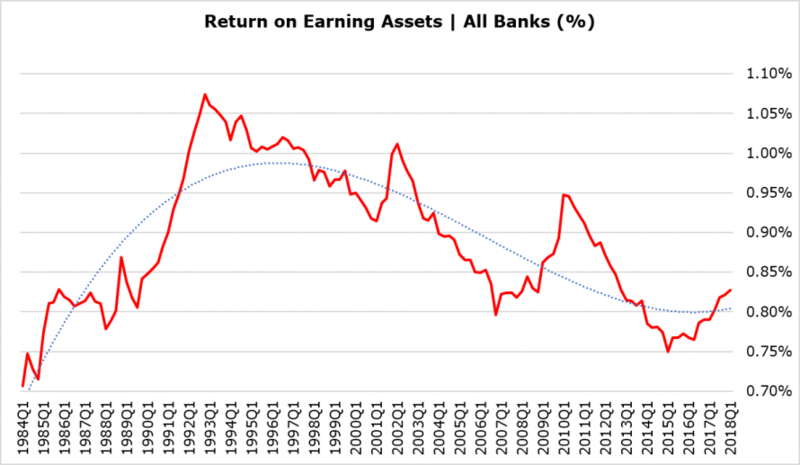 Over the past two years, the return on earning assets for all US banks has risen a whole 6bp to about 83bp in Q1 ‘18. To give you some context, since the end of the Volcker era at the Federal Reserve Board in the 1990s, the return on earning assets for all US banks has fallen 35bp from well over 1% to just 83bp on $15 trillion in change of earnings assets held by US banks. You must go back to the early 1980s when inflation was the chief concern of the Fed to see returns on earning assets fall to current levels. The Fed is raising the “floor” for US interest rates artificially by paying progressively higher interest on excess reserves (IOER), a fool’s errand our friend George Selgin at Cato has described in great detail. Meanwhile, asset returns are barely rising at a single digit rate, suggesting not only a flattening of the yield curve but an eventual compression of bank NIM. 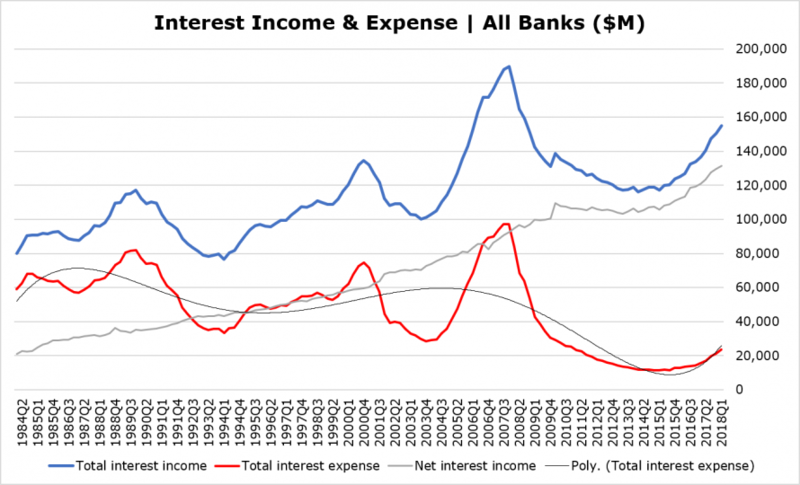 The timing of this unpleasant eventuality is anyone’s guess, but suffice to say that we could see quarterly interest expense double from the current $25 billion by year-end as bank liabilities reprice at the larger institutions. So visibly shrinking NIM by, say, Q1 ’19? If you divide US banks into two groups, you have JPMorgan (JPM), Citigroup (C), Goldman Sachs (GS), Morgan Stanley (MS), Capital One (COF) and the foreign banks operating in New York, which all depend largely on market funding for their deposits. Then you have the likes of Wells Fargo (WFC), Bank America (BAC), US Bancorp (USB) and BB&T (BBT), etc., which all have far larger portions of their book funded off of stable core deposits. These core deposits are far less costly than the current market for institutional funding. In Q1 ’18, the cost of funds for the entire US banking industry was 60bp while the net interest margin was 3.32%. Smaller banks have an appreciably lower funding cost. But should the current rate of change in interest costs continue to accelerate, then net interest margin is likely to come under pressure. Indeed, we suspect that the few shops on Wall Street that actually try to connect macro markets with bank balance sheets have already gotten the joke. So don’t just think of Q2 ’18 earnings as the start of a bonanza in bank equity returns – it is, for now. Think of it as being perhaps the near-term peak in bank revenue and earnings for the cycle. When the rate of increase in bank interest expense rises to the 75% range, NIM will start to visibly contract. Indeed, given the wondrous dynamics of QT, we may actually see interest earnings of banks stagnate. And this is a problem entirely of the FOMC’s own creation. The chart below shows the state of play in terms of bank NIM as of Q1 ’18. When that net interest income flattens out in about 3-4 quarters, bank default rates should be reverting to the mean rather violently. Ditto to Yra Harris talking to Rick Santelli of CNBC the other day. Enough with the rate hikes already! A flat yield curve = recession. Hello!! Does Chairman Jerome Powel really understand the concept of option-adjusted duration, as Zero Hedge suggested previously? The FOMC ought to stop pushing up the interest rate floor and simply let the QE bond pile run off as the bonds mature. When enough of the resulting new issuance of debt is in private hands, long-term interest rates will rise, market deposit rates will soar and credit spreads may actually widen. Then we will have a recession and also a credit crisis. Until these things happen, asset returns for US banks will remain constrained. To paraphrase Professor Edward Altman of NYU, we are headed “for a mess” in credit.